Welcome to Piece of Heart, where we look at The Legend of Zelda series through the eyes of a literary professor and examine how the literary elements found in the games enhance the overall experience. Literature is a beating heart that pumps its influence into even the furthest reaches of this celestial body, and each literary example that exists in The Legend of Zelda is a piece of that heart. Every two weeks we’ll cover a different chapter of Thomas C. Foster’s How to Read Literature Like a Professor and examine what components of the lesson appear throughout the Zelda series. This week’s lesson is titled “Nice to Eat with You: Acts of Communion” and states that the act of sharing a meal with someone is often written intentionally to show emotional development between characters. The way the food is eaten and the type of food affect the meal’s purpose, just as breaking bread signifies peace. Whatever the situation, a communion has the literary implication of: a coming together, of sharing, of uniting under a common trait, of getting along, and of disunity when used ironically. 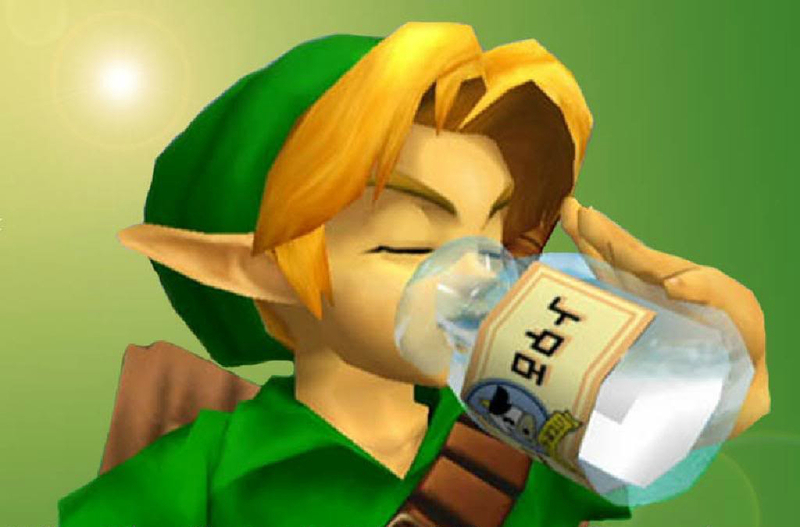 There are plenty of opportunities to consider a communion in Zelda; every time Link is given milk, whenever a potion is created, even being given a bottle can be considered eating together. Malon giving Link an egg in Ocarina of Time seems inconspicuous, but it immediately set a precedent for their relationship. It connected the two of them, and signified that their relationship would really only become active once they were grown. Just like a Cucco doesn’t crow until it has hatched, Malon didn’t aid Link on his quest until after he’d been sealed in the Chamber of the Sages for seven years, only then did she teach him Epona’s song. One of the best examples of a communion in Zelda occurs in The Wind Waker, between Link and his grandmother. Once Link’s little sister Aryll is captured by the Helmaroc King, and Link goes off to save her, Link’s grandmother sinks into a deep depression. The only thing that brings her back to health is Link giving her a fairy. After this, Grandma gives Link “Elixir Soup” which heals both his health and magic, and doubles his attack power until he takes damage. The beauty of this gift is plain to see, two family members reunited by exchanging items of healing. Link’s grandmother is expressing her love, concern, and utmost support of Link by aiding him in this way. Even its name “Elixir” shows this, as in Greek mythology the Elixir of Life would grant eternal youth; Link’s Grandmother could see how fast Link was growing up and wanted to prolong his time with her (but we’ll get into Greek mythology in a later installment). 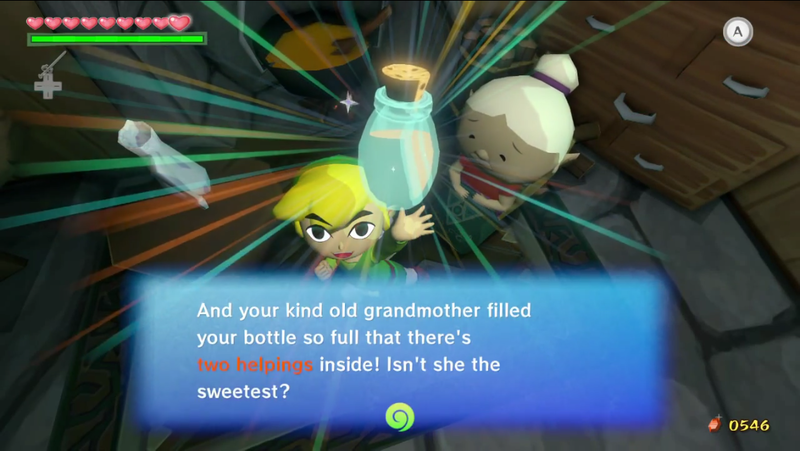 A single bottle can hold two helpings of this drink, so Link would have multiple reminders of his Grandmother’s love. 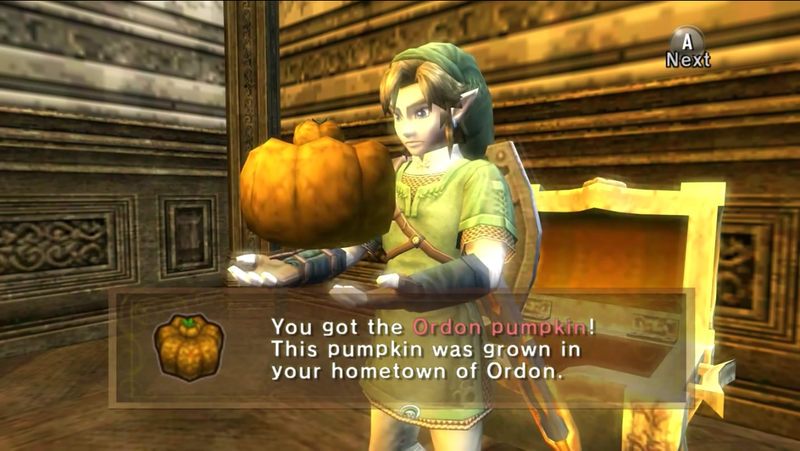 Link smiles every time before gulping down the Elixir, which shows his fondness for her, even when they’re apart. Twilight Princess was one of the most emotionally impactful Zelda games for me and Snowpeak Ruins is one of my favorite temples, and there just so happens to be a perfect example of a “dinner-gone-wrong” ironic use of communion hidden there. Once again, soup is involved. But in this case it’s made with pumpkins, cheese, and disappointment rather than love. Yeta, the sick wife of Yeto, repeatedly gives Link wrong directions to the Mirror Shard and instead directs him to get different ingredients for soup. This may all seem perfectly innocent, until it’s discovered that peering into the Mirror Shard made Yeta demonic and possessive, and it’s discovered that she was deliberately trying to prevent Link from getting the mirror. The literary idea of the type of food having an effect on its message comes into play as the ingredients for this soup were an Ordon Pumpkin and Ordon Goat Cheese. It’s almost as if Yeta was attempting to warn Link, to tell him to go back home and abandon his quest; so much for togetherness. Oddly enough the soup could heal Link, and every time a new ingredient was added the healing effects became stronger, but this was a ruse in itself. Link would be injured while getting the ingredients, and the stronger the soup the harder the tasks ahead became, at least for me. This soup also represented disunity in the relationship between Yeta and Yeto; the loving husband was taking care of his sick wife, all the while she was fine and simply using both Link and Yeto to protect her only love–the Mirror Shard. Communions in Zelda games serve as foreshadowing mechanisms as well as tools to add or emphasize character development and emotional depth in situations that wouldn’t necessarily have the same impact otherwise. There are still a myriad of examples of communion in the Zelda series that can be examined, but these were the few that struck me. It is my hope that at least a few of you will view shared meals in video games in a new light from now on. What did you guys think of the first installment of Piece of Heart? Did this change your view on meals in video games and literature? Express your opinions in the comments, and feel free to comment your own analyses of other communion-like situations found in Zelda!